The Trees of Unknowing, Vehicule Press, Montreal, 1978, 72 pp. Divisions, Coach House Press, Toronto, 1983. 64 pp. Family Album, Caitlin Press, Vancouver, 1989, 64 pp. The Compass, (Book One, The Shadow Trilogy), Empyreal Press, Montreal, 1993, 72 pp. The Yoni Rocks, (Book Two, The Shadow Trilogy), Empyreal Press, 1995, 64 pp. The Mystic Beast, (Book Three, The Shadow Trilogy), Empyreal Press, Montreal, 1997, 72 pp. Mapping the Soul, Selected Poems 1978-1998, The Muses' Company, Winnipeg, 1998, 182 pp. Girouard Avenue, Coracle Press, Montreal, 2009, 78 pp. 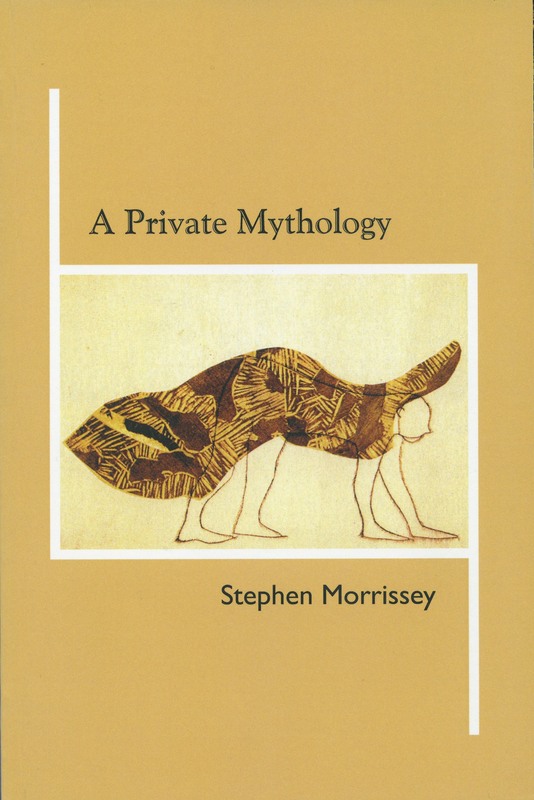 A Private Mythology, Ekstasis Editions, Victoria, 2014, 89 pp. Poems of a Period, Montreal, 1971, 20 pp. The Divining Rod, Greensleeve Editions, Edmonton, 1993, 20 pp. The Beauty of Love, The Poem Factory, Vancouver, 1994, 10 pp. The Carolyn Poems, The Poem Factory, Vancouver, 1995, 20 pp. 1950, The Poem Factory, Vancouver, 1996, 6 pp. Hoolahan's Flat, Oxford Avenue, Coracle Press, Montreal, 2005. Remembering Artie Gold, Coracle Press, Montreal, 2007. The Coat Poems, Coracle Press, Montreal, 2012, 16 pp. Patrick Morrissy and Mary Phelan, Some of Their Descendants and Relatives in Canada. (Online at The Internet Archive). The Aquarian Symbols, The 360 Degrees of the Zodiac , Coracle Press, Vancouver, 2000, 48 pp. Morrissey, Stephen. Two untitled concrete (haiku) poems. Sixth Assembling/ A collection of otherwise unpublishable manuscripts. Eds. Kostelanetz, Richard and Mike Metz. Brooklyn, NY, unpaged, 1975. Print. Morrissey, Stephen. “Painted Billboards”. Things To See, A Package Of Visual Projects, compiled by Isabel Dowler-Gow, Montreal, QC, 1976. Print. Morrissey, Stephen. “regard as sacred”. Montreal Poets’ Information Exchange Sampler. Ed. Mattie Falworth. Montreal Poets Information Exchange (MPIE). Montreal, QC, 1976. Print. •Morrissey, Stephen. The Poem Company, Phase Three. Ed. Ed Varney. Intermedia Press, Vancouver, BC, 1977. Print. Morrissey, Stephen. “there are seashells and cats”, “new year’s day 4 a.m.”, “regard as sacred”, “I am aiming for the hermetic statement”. Montreal English Poetry of the Seventies. Eds. Farkas, Andre and Ken Norris. Montreal, QC, Vehicule Press, 1977. Print. Morrissey, Stephen. “Divisions”. The Vehicule Poets. Ed. John McAuley. Maker Press, Montreal, QC, 1979. Print. Morrissey, Stephen. “R.M. Bucke as Critic”. Critical Assembling. Ed. Richard Kostelanetz, Assembling Press, Brooklyn, NY, 1979. Print. Morrissey, Stephen. "regard as sacred". Sounds Like, A stereo recording of sound poetry by eight Montreal poets. Eds. Norris, Ken and Endre Farkas. Vehicule Press, Montreal, QC, 1980. Long play 33 1/3 rpm audio. Morrissey, Stephen, Ken Norris, Claudia Lapp, John McAuley, Artie Gold, Endre Farkas, and Louis Dudek. A Real Good Goosin', Talking Poetics, Louis Dudek and The Vehicule Poets. Interview by Louis Dudek. Maker Press, Montreal, QC, 1981. Print. Morrissey, Stephen. “The Trees of Unknowing”, “Waves”, “I lie upon you...”, in Cross/Cut, Contemporary English Quebec Poetry. Eds. Van Toorn, Peter and Ken Norris. Montreal, QC: Vehicule Press, 1982. Print. Morrissey, Stephen. “The Insecurity of Art, five statements”. The Insecurity Of Art, Essays On Poetics. Eds. Ken Norris and Peter Van Toorn, Vehicule Press, Montreal, QC, 1982. Print. Morrissey, Stephen. “on the death of Max Ernst”. In Poetry Agenda Poesie 1984. Ed. Endre Farkas. Montreal, QC: The Muses’ Company, 1984. Print. Morrissey, Stephen. “Insecurity of Art: Statement # 5”, “Mother in 1988”, “I owe the world nothing”, “A Day in 1957”, “Regard as Sacred”, The Other Language. Ed. Endre Farkas. Montreal, QC: The Muses” Company, 1989. Print. Morrissey, Stephen. “The Insecurity of Art: 5 Statements”, “An Interview With Stephen Morrisey”, “The Whip”, “The Clothes of the Dead”, Vehicule Days, an unorthodox history of Montreal’s Vehicule Poets. Ed. Ken Norris. Montreal, QC: NuAge Editions, 1993. Print. Morrissey, Stephen. “The Compass”. In Windhorse Reader: Choice Poems of ’93. Ed. John Castlebury. Yarmouth, NS: Sumarai Press, 1993. Print. •Morrissey, Stephen. The Poem Factory: Series One. Ed. Ed Varney. Vancouver, BC: Poem Factory, 1994. Print. Morrissey, Stephen. “My Shadow”. Quebec Suite. Ed. Endre Farkas. Montreal, QC: The Muses’ Company, 1995. Print. Morrissey, Stephen. "The First Person in Literature". Eternal Conversations: Remembering Louis Dudek. Eds. Gnarowski, Mike, Aileen Collins, and Sonja Skarstedt. Montreal, QC: DC Books, 2003. Print. Morrissey, Stephen. “An Evening in 1957”, “First Night in the Big House”, “The Therapy is Incomplete”, “For My Love”, “Homage to Louis Dudek”, “Three Dream Visits From the Psyche”, “The Colours of the Irish Flag”, “The Rock”. The Vehicule Poets_Now. Eds. Konyves, Tom and Stephen Morrissey. Winnipeg, MA: The Muses” Company, 2004. Print. Morrissey, Stephen, Ken Norris, Artie Gold, Claudia Lapp, Tom Konyves, John McAuley, and Endre Farkas. "The Vehicule Poets". Language Acts: Anglo-Quebec Poetry 1976 to the 21st Century. Eds. Camlot, Jason and Todd Swift. Montreal, QC: Vehicule Press, 2007. Print. Morrissey, Stephen. "The Mountain", After the Mountain, The A.M. Klein Reboot Project. Ed. Jason Camlot. Montreal, QC: Synapse Press, 2011. Print. Morrissey, Stephen. La bête mystique, French translation of The Mystic Beast (1997), trans. Élizabeth Robert. Montreal, QC: Les Editions Triptyque, 2004. Morrissey, Stephen. Contre-taille, poèmes choisis de vingt-cinq auteurs canadiens-	anglais. "La marche en avant du poèt", "Au Mexique", "Dans ce théâtre de la vie", "Poème, je ne dois rien au monde". Choix, présentation et traduction des textes par Pierre DesRuisseaux, Préface de Louis Dudek. Montreal, QC: Triptyque, 1996. Morrissey, Stephen. Co-Incidence, poètes anglophone du Québec. "Jusqu’à ce que les ombres disparaissent", "Le rêve di nihiliste", "Dans la rivière", "La baguette divinatoire", "Réincarnation", "La magie ancienne", "L’isolement", "Poème (ne somes-nous pas les explorateurs de la conscience)", choix des textes et traduction par Pierre DesRuisseaux, Préface de Ken Norris. Montreal, QC: Triptyque, 2000.